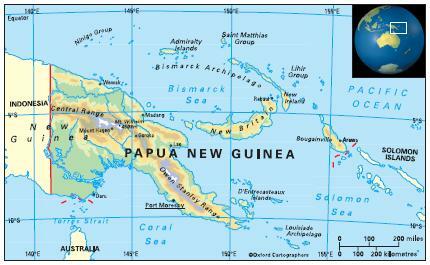 The Independent State of Papua New Guinea in the South Pacific shares a land-border with Indonesia; its other near neighbours are Australia to the south and Solomon Islands to the east. Papua New Guinea includes the eastern half of the world’s second biggest island, New Guinea, bordering the Indonesian province of Irian Jaya to the west. The rest of the country is made up of about 600 small islands, the chief of which are the Bismarck Archipelago, the Trobriands, the Louisiade Archipelago, the D’Entrecasteaux Islands, and some of the islands in the Solomons group, including Bougainville. The country comprises 22 provinces including the National Capital District (greater Port Moresby) and the Autonomous Region of Bougainville. Tropical monsoon type, hot and humid all year, though somewhat cooler in the highlands. Rainfall is chiefly from December to March. High mountains receive occasional frost and even snow. The most significant environmental issues are rainforest deforestation as a result of growing commercial demand for tropical timber; pollution from mining projects; and severe drought. 7,167,000 (2012); 13 per cent of people live in urban areas. The population growth rate stood at 2.5 per cent p.a. between the years of 1990 and 2012. In 2012 the birth rate was 29 per 1,000 people (42 in 1970) and life expectancy was 62 years (43 in 1970). The people are of mixed (mostly Melanesian) race, with small communities of Polynesians on outlying atolls. There is a declining non-indigenous population (several thousand Australians and a small Chinese population). Papua New Guinea is classified as a lower-middle income economy by the World Bank.